Biopolymers are the biodegradable polymers made of starch, sugar, cellulose and many more.Biopolymers coating in the packaging retard unwanted moisture transfer in food products, are good oxygen and oil barriers, are biodegradable, and have potential to replace current synthetic paper and paperboard coatings.Biopolymerbased materials have gathered attention from packaging industry due to rising concerns in recent years from environmental as well as economic perspectives of traditional petroleum based polymers. Pharmaceutical industry has seen a lot of regulatory actionto raise the bar for packaging of products. It accounts for potential machines for 100% non-destructive inspection of seal integrity. 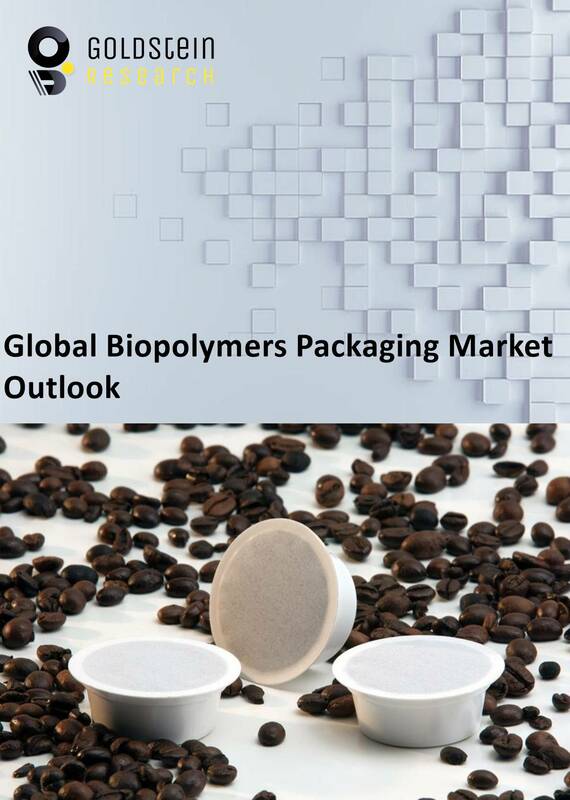 Goldstein Research analyst forecast that the global biopolymer packaging market size is set to reach USD 17.4 billion by 2024 growing at a CAGR of 15.4% over the forecast years. The growth of biopolymer packaging market is anticipated to grow on the lines of the existing traditional polymer market, being the closest and sustainable substitute. For instance, McDonald’s in 2016 used 50% of its guest packaging from sustainable sources and is dedicated to increase its share to 100% sustainable packaging. The report covers the present ground scenario and the future growth prospects of the biopolymers packaging market for 2016-2024 along with the import and export data of biopolymer packaging materials. We calculated the market size and revenue share on the basis of revenue generated from major players and sales of sustainable polymers across the globe. On the basis of end-use industry, food and beverages industry represent the largest consumption of packaging materials. Food and beverages industry holds 28.0% market share of the total biopolymer packaging market and is expected to continue to grow at a CAGR of 3.8% over the forecast period. Agriculture sector is the fastest growing segment at a rate of 4.3% annually owing to rising demand for bio-polymer packaging to ensure the quality of packaged agricultural products. the handling of the seeds and other agricultural materials in biopolymer packaging and it keeps the materials away from the harmful impacts of the traditional polymers. Biopolymer packaging market outlook 2016-2024, has been prepared based on an in-depth market analysis from industry experts. The report covers the competitive landscape and current position of major players in the biopolymer packaging market. The report also includes porter’s five force model, SWOT analysis, company profiling, business strategies of market players and their business models. Global biopolymer packaging market report also recognizes value chain analysis to understand the cost differentiation to provide competitive advantage to the existing and new entry players. According to the report, packaging is the advertisement of the product which requires being as per the changing social trends, profitability, differentiation, environmental awareness and sustainability. Thus, there is a rising trend of consumers buying the products that are packed in biodegradable packages, whether the food or beverages or medicines or any daily need product, that are light weight, easy to store and attractive. The major driving factor for the growth of biopolymer packaging market is the rising government regulations over the use of traditional polymers, which is paving the way for biopolymers to be used in packaging. For instance, the joint Australia New Zealand Food Standards Code specified various regulation for the food manufacturers and retailers to not to use any materials that can cause any alimentary or respiratory problems, bodily harm, distress, or discomfort or any other hazards to consumers. Further, the major challenge for the biopolymer packaging market is the availability of the feedstock and biomass for the purpose of developing biopolymers.The land area need to grow biomass for material purpose is 2.0% which was 106.0 million hectare globally in 2015. The concerns of food security are raising the problems for the availability of feedstock. Based on geography, Asia-Pacific has largest market share in biopolymer packaging market of 48.2%share in 2016owing to the large production of agricultural produce that is available for the manufacturing of biopolymers. Also the packaging industry in Asia-Pacific has been growing at a CAGR of 13.0% which will be taken over by biopolymer packaging in the near future. Latin America biopolymer market is growing at a fast pace of 6.1% in 2016 due to the increasing presence of biopolymer manufacturers. Other high-flying vendors in the nail care market are: ENSO Plastics, Cyclicor, IEI Plastics, MBA Polymers, Novomer. What is the revenue of biopolymer packaging market in 2015-16 and what would be the expected demand over the forecasted period?